There has been quite a hubbub surrounding California Raisins this past week: Raisin farmers Laura and Marvin Horne were unanimously granted a hearing with the Supreme Court to challenge the constitutionality of the Raisin Marketing Order. 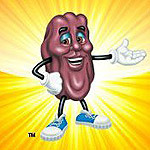 The marketing order was developed during the Great Depression to regulate raisin prices and requires raisin farmers to give a portion of their crops to the Fresno, CA-based Raisin Administrative Committee, which, in turn, distributes the dried fruits to causes like the federal-school lunch program. The Hornes claim that raisin farmers are not being properly compensated by the USDA. While we are eager to see how this case plays out (it has been going on since 2002, for grapes’ sake), we can’t help but be reminded of our favorite wrinkly-fruit commercial: this Motown ditty sung by the fictional band, The California Raisins. Fun Fact: the “band” had their own short-lived Saturday morning TV-show as well as a movie that went straight to VHS. There are over 550 videos of them on YouTube, including snippets from their Christmas albums and commercials starring Ray Charles and Michael Jackson. And if that isn’t amusing enough, check out their website. It has been preserved in all its 90’s glory. Ask Chris: What Happened to Those Giant Snails that Were Seized by Customs at LAX Last July?